According to the American Customer Satisfaction Index’s 2018 survey, Chick-Fil-A is American’s favorite fast-food restaurant (in terms of actual sales, though, it trails only McDonald’s and Starbucks). But what is the favorite inside Chick-Fil-A’s walls? Just like last year, when Chick-Fil-A released its most popular menu items of the preceding year, chicken is not at the top of that list. All hail the returning champion: Chick-Fil-A’s crispy waffle fries. When you look at the runner up (soft drinks), the ranks on this list begin to make sense. Everybody probably isn’t going to get the same kind of chicken sandwich, but most everyone is going to get a side of waffle fries, and a soda alongside that. 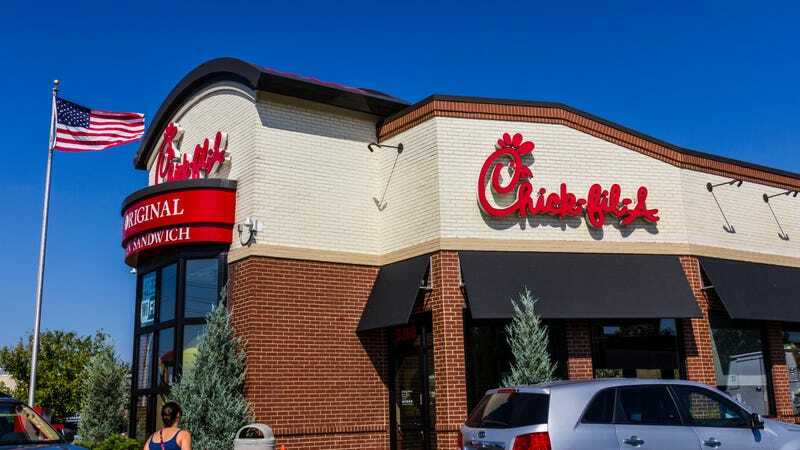 Fox News points out that chicken products still made up five items on Chick-Fil-A’s top 10, with nuggets at number 3 outranking the classic Chick-fil-A Chicken Sandwich at number 4, switching ranks from last year. Other non-chicken outliers include iced tea and lemonade and numbers 5 and 6 (same as last year), and hash browns at number 7 (taking the place of Chick-Fil-A’s milkshake, which did not make the Top 10 this year). But the rest, unsurprisingly, is all chicken, whether in strips (number 8), on a biscuit (number 9), or in the spicy chicken sandwich (number 10).